Nicosia. Gerald. “One and Only”, Cleis Press, 2012. Lu Anne Henderson lived in Denver in 1946 and she was fifteen years old. She met Neal Cassady who was a paragon of male sexuality and a macho man that made big promises and a big impression on her. He told her that he was going to Columbia University to become a writer and married her and took her with him to New York in her uncle’s car that he stole. Cassady never got to a classroom at Columbia and he and Lu Anne began to hang out with writers-to-be, among them Jack Kerouac and Allen Ginsberg. 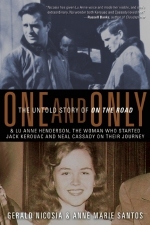 Lu Anne soon discovered that she was the secret link between Kerouac and Cassady who started what became known as the “Beat Generation”. This relationship between the three eventually became the basis for Kerouac’s masterpiece “On the Road” which was to become the seminal novel of the twentieth century. “One and Only” is an important addition to the literature of Beat America and it gives us a new look at the creative movement that took America by storm in the late 1950’s. This new book is bold and Lu Anne Henderson remains the survivor of the period—a time of Bohemian life in this country whose influence is still here even though the movement is gone. This entry was posted in GLBT non-fiction on September 29, 2012 by Amos.